We have made the argument on more than one occasion in the last few months that EBAY could be ripe for an activist picking (as recently as Jan 14th – New Trade $EBAY: eBAIT and back in Nov EBAY Looking More & More Like Activist Investor Bait). There were obvious fundamental reasons that led us and others to speculate; stock’s massive under-performance relative to its peers in 2013, its strong balance sheet, rock-bottom valuation relative to growth, and the ability to unlock shareholder value with the potential of a spin-off of faster growing PayPal………but the main reason for us was the nature of the options flow. It almost always had this contrarian smell to it. January 14, 2014: EBAY – looks like a bullish trader rolled calls out a month to catch next week’s Q4 earnings report expected Jan 22nd after the close. The trader sold 32,000 Jan 52 calls at 2.08 to close and bought 32,000 Feb 52.50 calls for 2.28 to open. January 6, 2014:EBAY – got hammered today, down almost 4% at the lows on speculation from Morgan Stanley that the company may be forced to lower long term guidance when they report their Q4 results on January 22nd. Looked like a sizable roll traded in Jan weekly calls where one trader sold 52k Jan 24th expiration 56 calls at .36 to close and bought 27k Jan 24th 52 calls for 1.71 to open. December 26, 2013: EBAY – Trader sold more than 50k of the Jan18th 55 calls to close at an average price of 1.327, and bought a similar amount of the Jan24th 56 calls to open for an average price of 1.61. 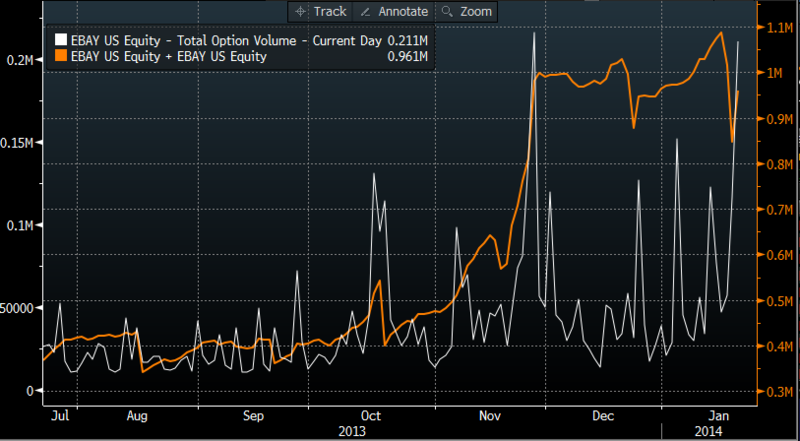 Trader likely rolled in order to capture the earnings event for EBAY in late January. November 26, 2013:EBAY – With the stock making new 52 week lows this morning, with the backdrop of new all time highs in major equity indices, one trader took a long term bullish position that breaks-even up 28% from current levels in July expiration. The July 62.50/65 Call Spread was bought 50,000x for .275. Prior to that trade, another bullish trade went up but in Jan, where the trader bought the Jan 2015 52.50/65 call spread 10,000x for 2.93. As regular readers know, we rarely chase unusual options activity as it is our experience that without knowing the trader/investor and their thesis, you are merely throwing a dart at a board. So we have been dogging the thesis, trying to use options to get the timing right, but have had a difficult time of doing so given the backdrop of poor results and guidance. But with the stock trading between $55 and $56 in the pre-market we may just have the right trade on (Jan24th/ April 55 Call Calendar). The idea was that Q4 results and forward guidance would disappoint and that we wanted to finance the purchase of longer dated calls by selling short dated ones, since we wanted to be around when the activist attack was launched. Well, perhaps a bit of luck and a bit of skill that Icahn announced his intentions at the same time that the company released weak earnings, but we have the EBAY right where we want it. And after a few months of detective work leading up to this trade, it would feel awfully good to have the hard work pay off with a nice winner. That being said if investors discount Icahn’s near term affect on the stock, and continues to trade on current fundamentals, we would be buyers at $55 or below with a long term time horizon.